a little sweet, a little tart, a lot of kitchen fun! Gobble tov! I’m busy preparing for our first (and last) ever Thanksgivukkah, a once-in-a-chaim event, if you will. While I don’t want to totally ruin the surprise for my guests, here’s a little sneak preview of the menu I’m planning, two days out. I’ll do a full recap, for sure, but I wanted to throw out some helpful links before the main event in case anyone is still looking for Thanksgivukkah recipes. 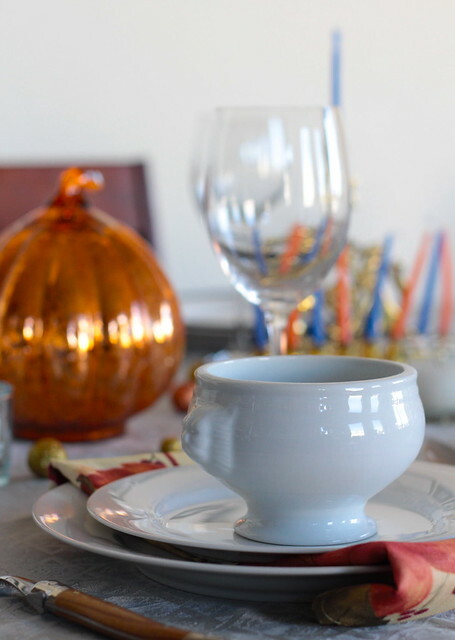 The decor will revolve around the two complementary colors of blue (for Hanukkah) and orange (for Thanksgiving). Seems like even the color wheel wanted these two holidays to collide. Alrighty, gotta run. Challah’s going in the oven! Is there anything as homey as the smell of fresh bread baking? 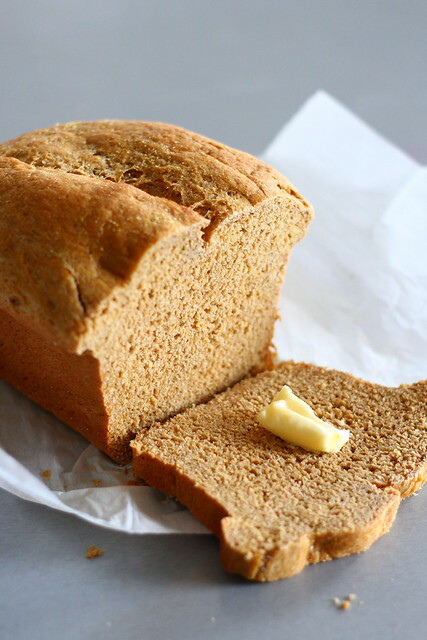 As Michael Pollan says, “Even if the bread turns out badly, the smell of it baking never fails to improve a house or mood.” The one bread that my mother baked growing up was anadama bread, following a recipe from her high school Latin club’s cookbook. I love this bread. The yeasty, molasses smell wafts through the house, hinting at a soft, doughy center that perfectly cradles a melting pat of butter. Biting into a slice, punctuated by a salty cornmeal crust, makes me sigh with pleasure. Heaven in a loaf pan. But because I’m Krista– and I like to monkey around with recipes– I wanted to see if I could make anadama bread a bit more wholesome, something I wouldn’t feel guilty about after chowing down two huge loaves. I would only declare my experiment a success if the bread was able to maintain its signature high rise and soft texture. After a bit of online research, I added more water to the recipe and sifted all seven cups of whole-wheat flour before adding it to the dough. Miraculously, it worked! I cried tears of joy (not really), ate way too many slices (yep), and promptly stored one loaf in the freezer. After all, if I’m going to spend several hours making bread, there better be some for later. In a medium saucepan over high heat, bring 3 1/4 cups water and salt to a boil. Gradually add corn meal, whisking constantly. Cook over high heat for one minute, whisking constantly. The cornmeal mixture will begin to boil and may splatter, so be careful. Remove from heat and whisk in molasses and butter. Set aside and let cool until just slightly warm, about 25 minutes. In the bowl of a stand mixer, dissolve yeast in 1/2 cup warm water until foamy, about 5 minutes. Using the paddle attachment on low speed, stir in cooled corn meal mixture. Gradually add the sifted flour, switching to the dough hook when necessary. Knead for an additional 6-8 minutes. Dough will be sticky. Cover and let rise until doubled. Punch down and let rise until doubled a second time. After second rising, form into two loaves and place in parchment-lined bread pans. Let rise again until doubled. Meanwhile, preheat oven to 350° F. Just before baking, brush tops with an additional 1-2 Tbs. melted butter and sprinkle lightly with additional corn meal and kosher salt. Bake for about 30 minutes, or until golden brown on top and bottom. Source: Adapted from the Hodag Cookbook. For the most part, Gabe and I have similar tastes. There are only a few foods I can’t stand that make him question why he’s marrying me (and/or if I’m actually American): ketchup, donuts, and kidney beans. But sharing your life with someone means making small adaptations, and one of those little changes is how we make our chili. Sans kidney beans. Plus sweet potatoes. I got this recipe years ago from a dear friend and hadn’t tried it yet because Gabe didn’t like sweet potatoes. 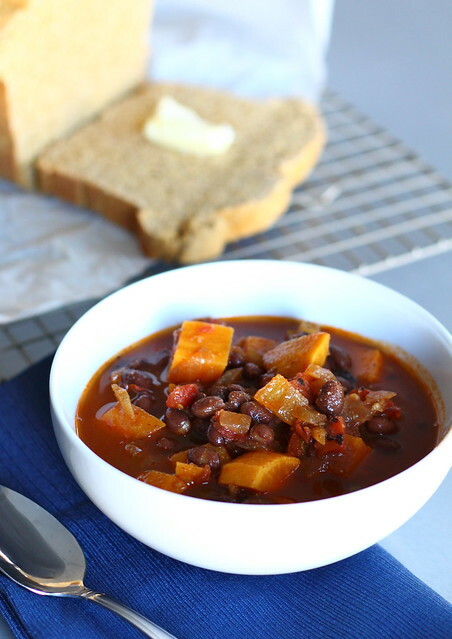 Lo and behold, he’s now a sweet potato fanatic and I’m still not eating kidney beans, so this recipe was perfect for us. I’m going to ignore the fact that my food aversions are strangely more entrenched than his and call it a win-win. Also, as you gaze at this hearty, delectable chili, you’re getting a sneak peek of an upcoming recipe. I’m clever like that. Enjoy! accompaniments: limes, avocados, cheese, sour cream, etc. Heat olive oil in large dutch oven over medium heat. Stir in onion and sweet potatoes and cook, stirring occasionally, until onions start to soften, about 6 minutes. Stir in garlic, chili powder, cumin, chipotle, and cayenne. Cook, stirring frequently, for one minute or until garlic is fragrant. Stir in chicken stock and bring to a boil. Reduce heat and simmer until potatoes are tender, about 15 minutes. Stir in black beans and tomatoes and bring to a simmer. Cook for an additional 5 minutes and add salt and pepper to taste. The chili is great as-is, or you can serve it with lime wedges, sliced avocado, shredded cheese, sour cream, etc. Source: Slightly adapted from Eating Well via Melanie Dethlefsen. Welcome to my little corner of the internet! I'm so glad you stopped by. If you would like to follow this blog and receive notifications of new posts by email, please enter your email address here.